As U.S. administration discusses Afghanistan escalation:	400 join Minneapolis anti-war protest | Fight Back! 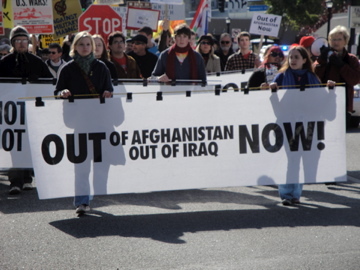 The protest in Minneapolis called for an end to the U.S. war in Afghanistan and an end to the occupation of Iraq. The protest came at a time when the Obama administration is considering a plan to escalate the war in Afghanistan by sending up to 40,000 additional U.S. troops. "The U.S. anti-war movement is back in the streets to make a clear statement against any escalation of the war in Afghanistan, to demand an end to that war and an end to the occupation of Iraq," said Meredith Aby, a member of the Minnesota-based Anti-War Committee, one of the groups in the coalition that planned the Minneapolis event. A statement issued by organizers says in part, "President Obama is reported to be listening to the generals about the next steps in Afghanistan; he should be listening to the people, who want an end to the war." The statement goes on to say, "There is growing sentiment among people in the U.S. against the war in Afghanistan. They want an end to the eight-year long war, not an escalation. During the worst economic crisis since the Great Depression, the U.S. government is spending billions for wars and occupations, while millions lose their jobs and housing and go without health insurance." Twin Cities-area organizations participating in the protest included the Anti-War Committee, Iraq Peace Action Coalition, Iraq Veterans Against the War, Military Families Speak Out, Women Against Military Madness, Twin Cities Peace Campaign, the Saint Paul Regional Labor Federation and many others. A member of the coalition explained that participants should be prepared to respond to any escalation of the war in Afghanistan by coming back into the streets with the anti-war message in the weeks ahead.